Brewery day, with both Avery and Boulder getting a visit. For those who want to glamorize breweries, Avery is a reality check. Located well off the beaten path in an industrial park on the outskirts of Boulder, the brewery would be difficult to distinguish from any other mid-size factory. The tap room was basically a garage. Luckily, the beers aren't as generic. At $1 a sample, it's also realistic to imagine trying each of the dozen or so beers they happen to have on tap that afternoon. I tried six, plus a pint. White Rascal: A Belgian White or witbier. Hazy lemonade, a very light color for a craft beer. One word to describe: EASY. This baby flows smoothly. Not over-spiced or packed with intense flavor, which was refreshing for this style. One of my favorite wheats I've had this summer. 14'er ESB: Hooked on the first sip. Dirty malt smell, with that English bitter hook. Tremendous lingering metallic hop flavor. A pungent punch after the light Rascal. Hog Heaven Barleywine: 104 IBUs? Quite hoppy for a barleywine, and it's evident from the start, because it is also dry-hopped. Earthy vegetable tasted, and much more bitter, as you may have guessed, than a traditional sweet barleywine. The hops snuff out the sweetness and you get a quite potent, almost imperial IPA aftertaste. Without the syrup. Here's an interesting side note: I didn't recall that I'd had this beer before, and was giving it the keen attention as if I hadn't. I ended up giving it 4.5 stars at the brewery, making it the highest-rated beer of the first three days. I loved it. When I got home, though, I checked my records (I also wasn't sure if I'd had the IPA) and found that I gave the Hog Heaven a lukewarm review when I first had it in March. So do I scribe another review in the journal? Treat it as new? Disregard my clearly off first opinion? I'd rather not go down that road. Once a beer is reviewed, it's official. However, it's obviously fine to change your opinions of a beer without changing the initial review. It's quite common to see revised reviews on both beer rating websites. I'd simply rather not have two entries for one beer on opposite pages in the same journal. A potential solution: an entirely separate journal with new reviews of previously sampled beer. It would be interesting, I think, to see how my taste buds and preferences change over time. I could do this by comparing beers of similar styles from year to year, as well, but I think i may give this idea a try. A sort of second chance journal. Back to the beers. Fourteen: Avery's 14th anniversary American Strong Ale. Replacing the recently-cashed sixteen on tap. Chocolate malt sweetness, and am I picking up a tiny mint smell? Tastes of figs and cocoa. A pint of this would knock me out. Quite good. IPA: Fairly subtle and straightforward. I took note of the particularly strong lacing this one left on the glass. Centennial hops come through, but not as favorably as say, Founders IPA. Not the best IPA I've had, but still a nice beer. Dry-hopped IPA: A special tap room only offering. Much cloudier than the regular IPA, and much more pungent. Smells exactly like clover. Like a weedy garden. One of the most unique smells I've found. The weeds provide for a pretty strong aftertaste as well. Really bitter finish. Not really much better than the regular, which surprised me a bit. The Kaiser Imperial Oktoberfest: Tapped for the first time this year while we were there, which is fun. Not a lot of liveliness here--very low carbonation. Sweet, malty smell, with a really creamy mouthfeel. Strong aftertaste of Euro hops. Has a very strange sweetness as well, almost grape. Unusual beer. I think a pint of it may be too much for me. No duds at Avery, that's for sure, and several interesting options worthy of conversation. I passed on the Maharajah, a beer that I've had several times and love, and wasn't really interested in the brown or the porter. All in all, I was happy with the samples I tried, and would have stayed for more had I not felt it necessary to leave room for the imminent stop at Boulder Beer. 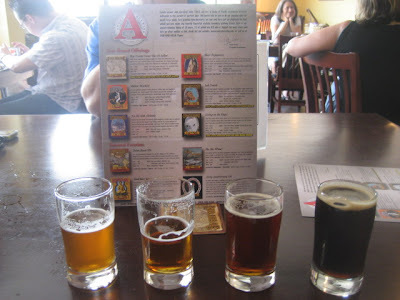 I loved the Maharaja at the Avery brewery, my fave by far. Now I'm just plain sick to my stomach. Boulder was on our itinerary but we couldn't make it. I'm glad I can live it through you. And you're totally right, it is amazing how our tastes can change over time. Also, brewers tweak recipes from time to time or maybe you just had a bad one the first time. Glad it was good this time. I have yet to try the Hog Heaven.